Report to LEGO Hero Factory briefing room immediately. The evil brains are trying to take over the galaxy and we need some heavy-duty defenses to fend them off. We are equipping you with Hero Factory weapons: a high-impact shield, visor armour and hero core locking clamps. Your high-speed laser drill is perfect for breaking through the rocky armour of 44005 BRUIZER. Be ready for anything in this battle. This toy costs approximately £7.99 (for the latest and best prices make sure you check our retailer list for the LEGO Hero Factory Bulk 44004 above). 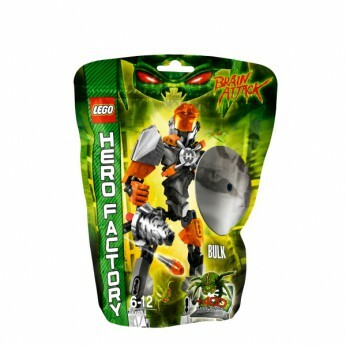 In our review of LEGO Hero Factory Bulk 44004 we classed it as being suitable for ages 6 years, 7 years, 8 years, 9 years, over 10 years but recommend you check the manufacturer specific advice before purchasing.